Figure 1. 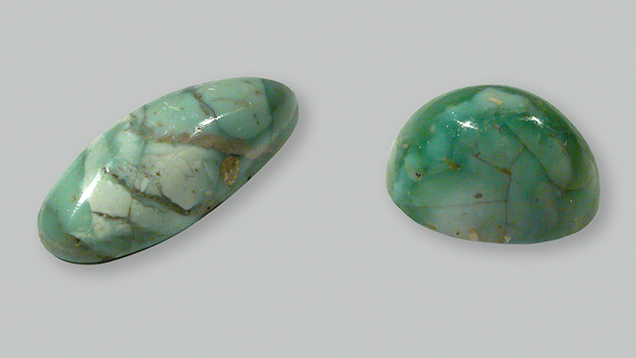 These two variscite cabochons from central Tajikistan (1.8 × 0.7 × 0.3 cm and 1.2 × 0.5 × 0.6 cm) were cut from the samples used in the study. Photo by N.N. Krivoschekov. An occurrence of variscite containing strengite, as well as other minerals from both the variscite and metavariscite groups, was discovered in the late 1970s in central Tajikistan. The material, ranging from light blue to light green to green, is suitable for cabochon cutting. 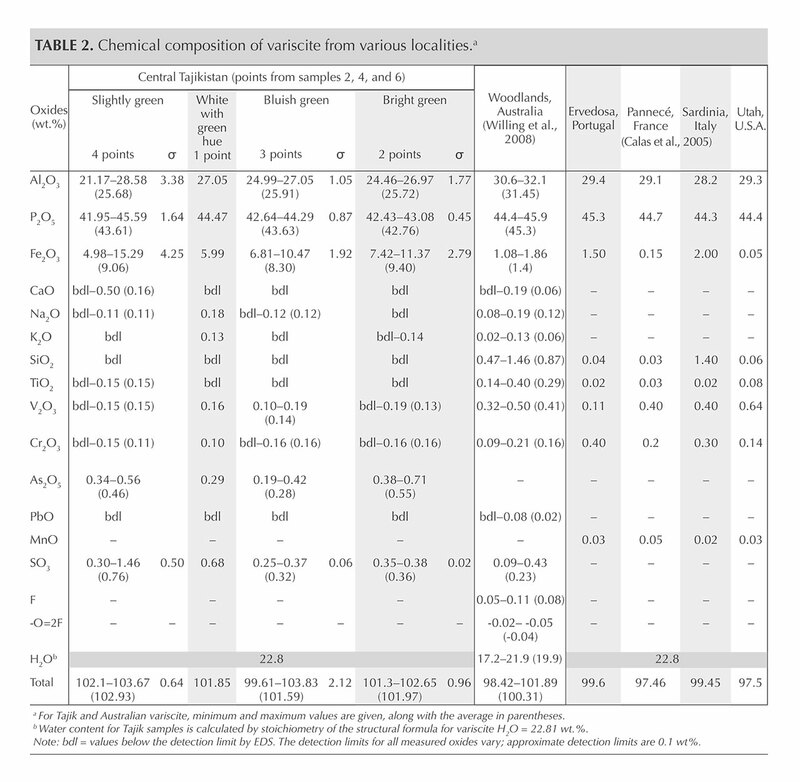 The samples presented in this study showed traces of sulfur and arsenic, with higher iron and generally lower vanadium and chromium concentrations than variscites reported from other localities. These differences may result from the intergrowth of variscite with other minerals from the variscite and metavariscite groups. 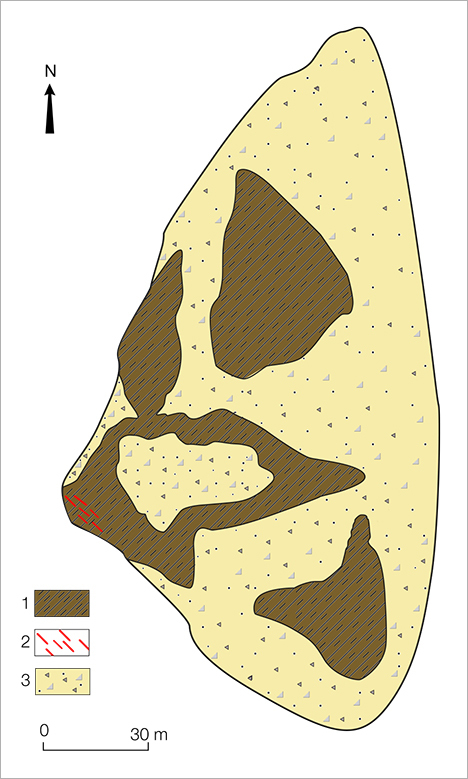 Variscite (figure 1), a relatively common cave mineral that forms as a result of phosphate-bearing surface solutions reacting with aluminum-rich rocks (Calas et al., 2005), where the phosphate is provided by guano decomposition (Onac et al., 2004). First described in 1837 from a source close to Variscia, the former name of the Vogtland region in northeastern Germany, its chemical formula was determined in 1896 (Willing et al., 2008). Yet variscite was used in Neolithic jewelry and is found in many archaeological sites (e.g., Ervedosa, Portugal; Pannecé, France; and Sardinia, Italy; see Calas et al., 2005; Middleton et al., 2007; Querré et al., 2007; Willing et al., 2008). Variscite is a member of the hydrous aluminum phosphate group, Al(PO4)·2H2O, while strengite is part of the iron phosphate group, Fe3+(PO4)·2H2O. Both are orthorhombic phosphate members of the variscite mineral group, while mansfieldite, scorodite, and yanomamite are the arsenate isostructural members of this group. The general chemical formula of variscite group minerals is A(XO4)·2H2O, where A = Al, Fe3+, In and X = P, As. Phosphate members of the variscite group (variscite and strengite) are isodimorphous with the metavariscite monoclinic phosphate mineral group members metavariscite and phosphosiderite, respectively. Most of the variscite in the market today comes from the state of Utah, close to the cities of Lucin and Fairfield, though some of these mines are practically exhausted (Larsen, 1942; Solodova et al., 1985; Willing et al., 2008). The occurrences at Woodlands, Western Australia, and Yauli, Peru were discovered in 2004 and 2011, respectively (Willing et al., 2008; Hyršl, 2011). Among the minerals of the variscite and metavariscite groups, variscite is most often used for carvings and ornaments (see Koivula, 1986; Fritz and Rockwell, 2006; Willing et al., 2008; and Hyršl, 2011). Variscite has a waxy luster and is transparent to translucent with a color range from white to brown and blue to green to yellow, which can cause misidentification as turquoise and chrysoprase (Willing et al., 2008). The Mohs hardness of the mineral is 3.5 to 4.5, as opposed to turquoise and chrysoprase, which both range above 5 (again, see Palache et al., 1951). In 1979, variscite-bearing veins were found by one of the authors (AKL) in the headwaters of the Shing River, southwest of Marguzor Lake (39°09΄ N, 67°50΄ E; figure 2) in central Tajikistan. The occurrence is situated within the jaspers of the Akbasayskaya suite in the Shing-Magian antimony-mercury ore district, 1 km east of the Chorroha antimony deposits (currently not in operation). The region forms the western part of the Zeravshan-Hissar structural-formational zone, which belongs to the Southern Tien Shan part of the Ural-Mongolian belt in the Hercynian mountain-folding region (Baratov, 1976). The collected samples, like those shown in figure 1, were visually identified at the mining site as chrysoprase, but X-ray powder diffraction (XRD) later determined that the material consists mainly of variscite and strengite, along with minor amounts of scorodite, metavariscite, phosphosiderite, jarosite, and quartz (Litvinenko et al., 2013). No mining activities have taken place in the area. Figure 2. 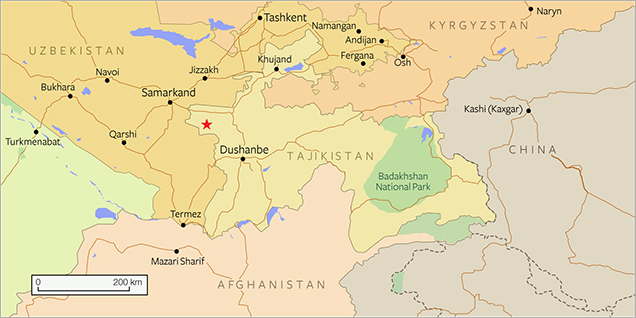 Top: A map of Central Asia and Tajikistan. The red star shows the occurrence of variscite with other minerals of the variscite and meta­variscite groups. 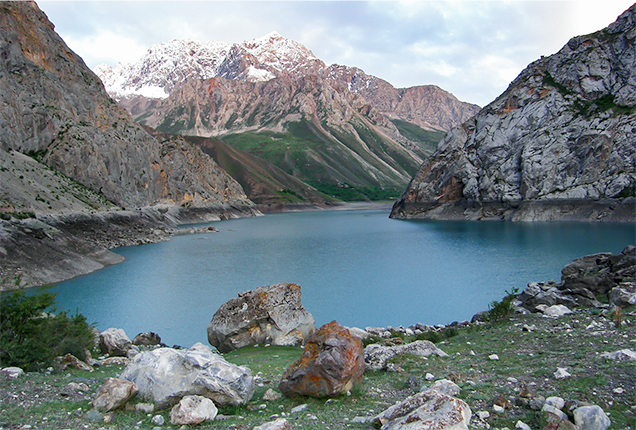 Bottom: Marguzor Lake, surrounded by carbonate rocks (Argskaya suite). The occurrence is located on the right, in the background behind the massif of carbonate rocks. Photo by A.K. Litvinenko. 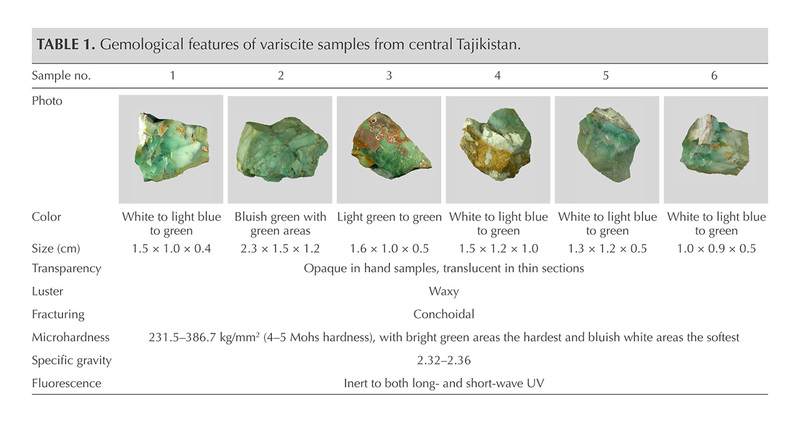 In this article, the gemological properties of variscite samples from central Tajikistan are presented along with spectroscopic and chemical data. The results obtained are also compared with the existing data found in the literature on variscite samples from other occurrences. For this study, we investigated six variscites from different parts of the veins (figure 3). The microscopic characteristics of the samples and their reaction under a 5-watt short-wave (254 nm) and long-wave (365 nm) UV lamp were examined. Microhardness was measured by a PMT-3 tester with a load weight of 100 g for 10 seconds. Hydrostatic specific gravity (SG) was measured with a digital balance. Reflectance spectra from 380 to 1080 nm were acquired with an Ocean Optics QE65000 spectrometer using an HL-2000-HP 20 W light source and an R600-7 Vis-NIR reflection probe, with a resolution of 1 nm, 20 scans, and an integration time of 500 ms. Chemical analysis was conducted with a Link ISIS energy-dispersive spectrometer (EDS) attached to a CAMSCAN-D4 electron scanning microscope. The following standards were used for quantitative measurements of elements within studied samples: synthetic Al2O3 (for Al), apatite USNM 104021 (for P), synthetic V2O5 (for V), synthetic Cr2O3 (for Cr), ilmenite USNM 96189 (for Fe and Ti), wollastonite STD 097 (for Ca), albite (for Na), synthetic microcline (for K), quartz (for Si), PtAs2 (for As), barite (for S), and PbTiO3 (for Pb). Raman spectra were acquired on a Renishaw Raman 1000 spectrometer coupled to a Leica DM LM microscope, using an Ar+ laser (514 nm) and 50× magnification. Laser power was 10 mW, with a 60-second acquisition time (three cycles), at a resolution of about 1.5 cm–1, in the range from 200 to 1200 cm–1. Rayleigh scattering was blocked using a holographic notch filter. Backscattered light was dispersed on an 1800 grooves/mm grating with slits set at 50 μm intervals, and the spectrometer was calibrated at 1332 cm–1 using a natural diamond as a reference standard. Figure 3. Geological scheme of the variscite occurrence: 1—jaspers of the Akbasayskaya suite, 2—veins of variscite and other minerals of the variscite and metavariscite groups, 3—quaternary sediments (after Litvinenko et al., 2013). The samples were aggregates ranging from light blue to light green to green (sometimes very similar to chrysoprase) and suitable for cabochon cuts of about 2 cm in length (again, see figure 1 and table 1). They had cryptocrystalline (rarely microgranular) structure, waxy luster, and conchoidal fractures. The measured microhardness was 231.5–386.7 kg/mm2 (between 4 and 5 on the Mohs scale), and SG ranged from 2.32 to 2.36. All samples were inert to long- and short-wave UV. These properties are consistent with those previously reported for variscite and slightly different from those of the other minerals from the variscite and metavariscite groups (Palache et al., 1951). 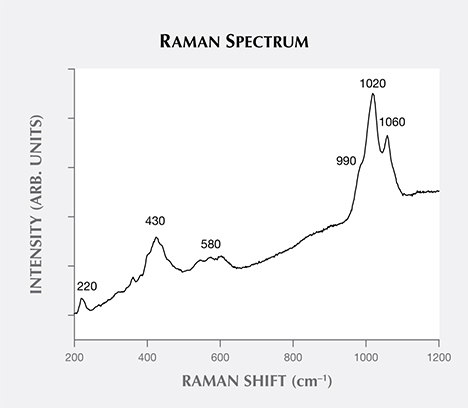 Figure 4 presents a Raman spectrum of one sample, studied previously by XRD (see Litvinenko et al., 2013). The most intense apparent maxima is at approximately 1020 cm–1, with two less intense peaks at around 990 and 1060 cm–1, all due to PO4 symmetric stretching vibrations of the minerals from the variscite and metavariscite groups (Frost et al., 2004; Onac et al., 2004). The most intense bands are due to variscite-stretching vibrations, but their exact position and shape are likely due to the presence of other minerals of the variscite and metavariscite groups, such as strengite and phosphosiderite. A series of less intense bands, the result of PO4 bending modes, are observed at about 580, 430, and 220 cm–1 (again, see Frost et al., 2004; Onac et al., 2004). Higher luminescence is observed in the green portion of the spectrum (figure 4). Quartz was also occasionally identified. Figure 4. 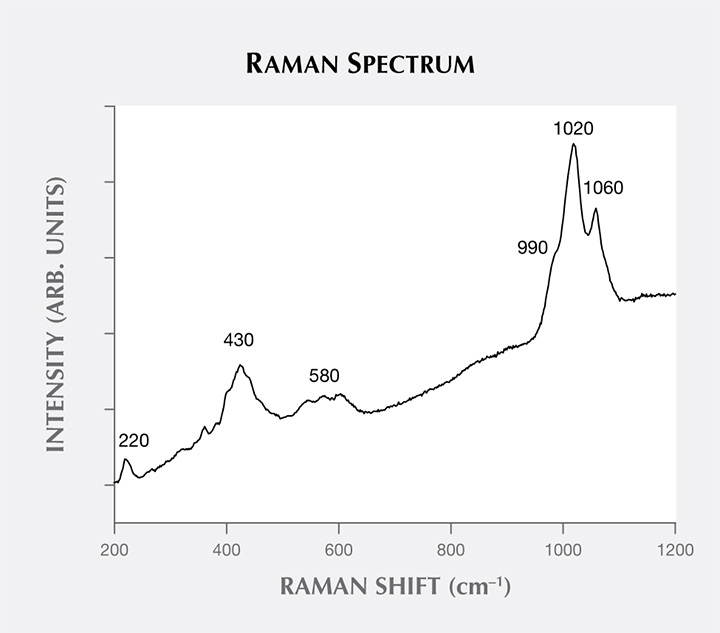 The Raman spectrum of sample 5 is in the 200–1200 cm–1 range. The most intense apparent maxima is at about 1020 cm–1. The less intense peaks at around 990 and 1060 cm–1 are due to PO4 stretching vibrations in variscite and other minerals of the variscite and metavariscite groups. The bands at around 580, 430, and 220 cm–1 are the result of PO4 bending modes. Chemical analysis using EDS on areas with various colors is presented in table 2. The chromophores Cr, V, and Fe were identified, along with small amounts of CaO, Na2O, K2O, TiO2, SO3, and As2O5. The atypical presence of SO3 and As2O5 is likely due to the site’s proximity to the Chorroha antimony deposit, with stibnite (Sb2S3) and arseno­pyrite (FeAsS) as main minerals. A variscite occurrence that cut through antimony rocks was found in 1905 in the north-central part of Mexico’s Querétaro state, though not directly associated with antimony minerals (White, 1947). Compared to variscite from other localities (Australia and the United States) and archaeological sites (Portugal, France, and Italy), the samples contained higher Fe2O3 (up to 15.29 wt.%) and generally lower V2O3 and Cr2O3 (again, see table 2). Higher amounts of iron could be caused by the presence of iron phosphates such as strengite (FePO4·2H2O, orthorhombic) and minor amounts of phosphosiderite (FePO4·2H2O, monoclinic). For some areas with greenish color, where the color is mostly due to ferrous iron content, Cr and V were below the EDS detection limit. 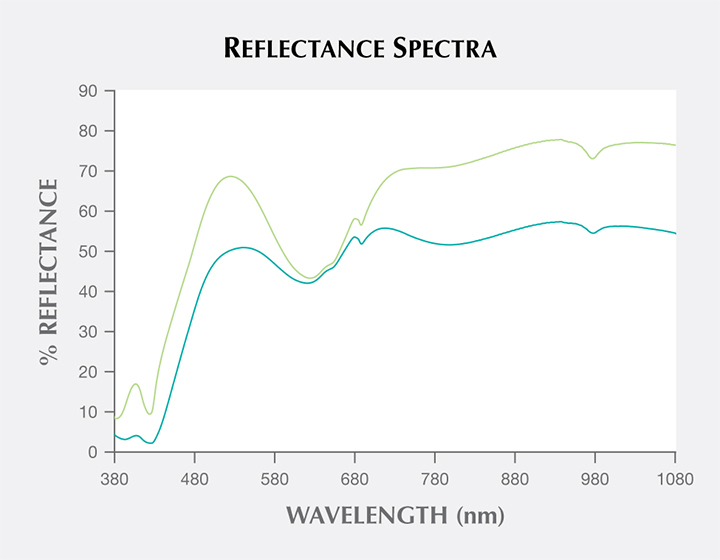 Figure 5 presents reflectance spectra of the green and bluish green areas from 380 to 1080 nm. The strong decrease in reflectance at around 425 nm is probably related to Fe3+; the large weak band above 750 nm is likely due to vanadyl groups rather than Fe2+ (Calas et al., 2005). The decrease in reflectance centered at around 630 nm (and an associated, barely visible decrease in the blue part around 445 nm), as well as the additional weak sharp reflectance decreases at about 645 and 690 nm, are assigned to spin-forbidden transitions of Cr3+ (Calas et al., 2005). 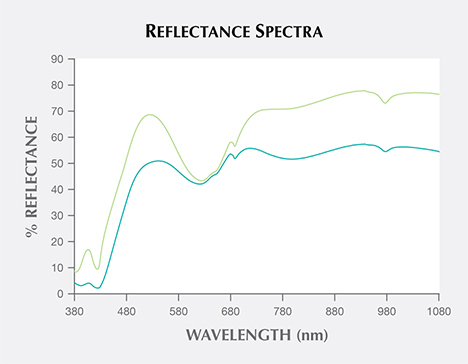 A gradual decrease of reflectance from the near-infrared through the visible region is also observed in both spectra, though it is more pronounced in the bluish green samples. The relative intensity of the iron- and chromium-related bands is higher on the bluish green part than on the green (again, see figure 5). The sharp band at around 975 nm in the near-infrared region is related to overtone vibrations of OH in the structural water (again, see Calas et al., 2005). Figure 5. Reflectance spectra of the green and bluish green areas of sample 5 in the 380–1080 nm range. The strong decrease in reflectance at around 425 nm is probably related to iron. Bands at 445 and 630 nm, along with the weak but sharp decreases at about 645 and 690 nm, are related to chromium. The peak at 750 nm is most likely due to vanadyl groups, while the one at 975 nm is related to overtone vibrations of OH in the structural water. The relative intensity of the iron- and chromium-related bands is higher on the bluish green part than on the green area. Samples of variscite intergrown with strengite and minor amounts of other minerals of the variscite and metavariscite groups were found in central Tajikistan; these samples range from light blue to green and are suitable for cabochon cuts about 2 cm in length. Their gemological properties were similar to those of variscite from other occurrences. Raman spectroscopy confirmed the presence of variscite as well as other minerals of the variscite and metavariscite groups. Vis-NIR reflectance spectra showed that the color is principally due to relative concentrations of iron and chromium and that the vanadium plays a minor role. Chemical analysis shows generally high iron concentrations, probably due to the presence of strengite, as well as lower chromium and vanadium than variscite samples from other localities. Additionally, the relatively high arsenic and sulfur contents of the samples may be linked to the Chorroha antimony deposit. Further structural and spectroscopic studies as well as detailed geological mapping of this occurrence are needed in order to fully understand its production potential. Dr. Litvinenko (litvinenko54@yandex.ru) is head of the gemology department at the Institute of Geology of Mineral Resources at the Russian State Geological Prospecting University in Moscow (MSGPU-RSGPU). Dr. Sorokina is a postdoctoral research associate at GIA in Carlsbad, California, and a research fellow at the Fersman Mineralogical Museum, Russian Academy of Sciences (RAS) in Moscow. Dr. Karampelas is senior research gemologist at GRS (Gem Research Swisslab AG) in Adligenswil, Switzerland. At the time of the study, he was a research scientist at the Gübelin Gemmological Laboratory in Lucerne. Mr. Krivoschekov is a senior specialist at the Fedorovsky All-Russian Research Institute of Mineral Resources (FGUP VIMS) in Moscow. Mr. Serov is a researcher at the Gemmological Centre at Lomonosov State University, Moscow. We are thankful to Prof. B.I. Pirogov and his colleagues from FGUP VIMS, Mr. M.U. Gurvich and his colleagues at MSGPU–RSGPU, Dr. A.A. Agakhanov of the Fersman Mineralogical Museum, and Mr. P.V. Kartashov of the Forensic Center of the Ministry of Internal Affairs of Russian Federation in Moscow for the opportunity to carry out analytical research, and for their consultation on this research project. Baratov R.B. (1976) The Division of Stratified and Intrusive Formations in Tajikistan. 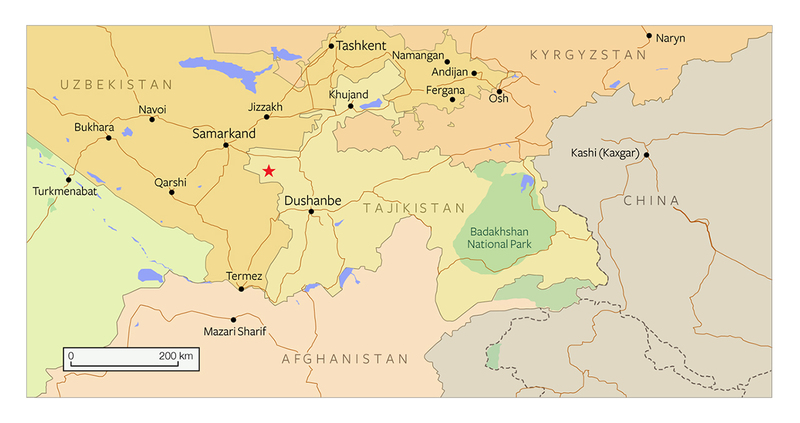 Donish Publishers, Dushanbe, Tajikistan, 268 pp. (in Russian). Fritz E., Rockwell K. (2006) Lab Notes: Variscite, resembling turquoise. G&G, Vol. 42, No. 1, p. 61. Hyršl J. (2011) Gem News International: Variscite from Peru. G&G, Vol. 47, No. 3, p. 251. Koivula J.I. (1986) Gem News: Metavariscite. G&G, Vol. 22, No. 4, pp. 247–248. Larsen E.S. (1942) The mineralogy and paragenesis of the variscite nodules from near Fairfield, Utah. Part 3. American Mineralogist, Vol. 27, No. 6, pp. 441–451. Litvinenko A.K., Sorokina E.S., Karampelas S., Iospa A.V., Krivoschekov N.N. (2013) Variscite and strengite of central Tajikistan – first finding. Izvestiya Vysshikh Uchebnykh Zavedeniy, Geologiya i Razvedka (Proceedings of Higher Education Institutions, Geology and Prospecting), No. 3, pp. 73–76 [in Russian]. Middleton A., La Niece S., Ambers J., Hook D., Hobbs R., Seddon G. (2007). An elusive stone: the use of variscite as a semi-precious stone. British Museum Technical Research Bulletin, Vol. 1, pp. 29–34. Onac B.P., Kearns J., Breban R., Panzaru S.C. (2004) Variscite (AlPO4:2H2O) from Cioclovina cave (Sureanu Mountains, Romania): A tale of a missing phosphate. Studia Universitatis Babes-Bolyai Geologia, Vol. 49, No. 1, pp. 3–14. Palache C., Berman H., Frondel C. (1951) Dana’s System of Mineralogy, Vol. II, 7th ed. John Wiley and Sons, Hoboken, New Jersey, pp. 756–761. Querré G., Herbault F., Calligaro Th. (2007) Long distance transport of Neolithic variscite ornaments along the European Atlantic arc demonstrated by PIXE analysis. The XI International Conference on PIXE and Its Analytical Applications, Puebla, Mexico, pp. 38-1–38-4. Solodova Yu.P., Andreenko E.D., Granadtchikova B.G. (1985) The Determinant of Gem and Ornamental Stones. Nedra Publishing, Moscow, 223 pp. [in Russian]. White D.E. (1947) Antimony deposits of the Soyatal district state of Queretaro, Mexico. Geologic Investigation in the American Republics, pp. 35–88, http://pubs.usgs.gov/bul/0960b/report.pdf. Willing M., Stöcklmayer S., Wells M. (2008) Ornamental variscite: a new gemstone resource from Western Australia. Journal of Gemmology, Vol. 31, Nos. 3–4, pp. 111–124. This large marble-hosted occurrence in the Pamir Mountains is a potentially productive source of corundum, including ruby with a bright red color reminiscent of “pigeon’s blood” Burmese rubies. Test your knowledge of our 2015 content by taking our annual Challenge.